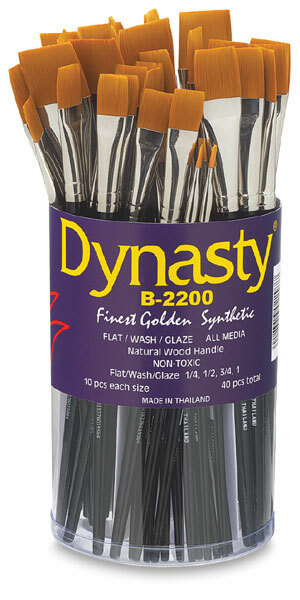 Fine gold synthetic hair is suitable for all types of media and the flat shape provides superb coverage with bold, sweeping strokes. Black lacquered handle offers a sure grip and control. The 40-piece canister set includes 10 each Flat 1/4", 1/2", 3/4" and 1". The handy 40-piece canister set includes 10 each Flat 1/4", 1/2", 3/4", and 1".